The 'Last Lockdown' statue was featured at voter-registration rallies to encourage support for candidates focused on gun control. 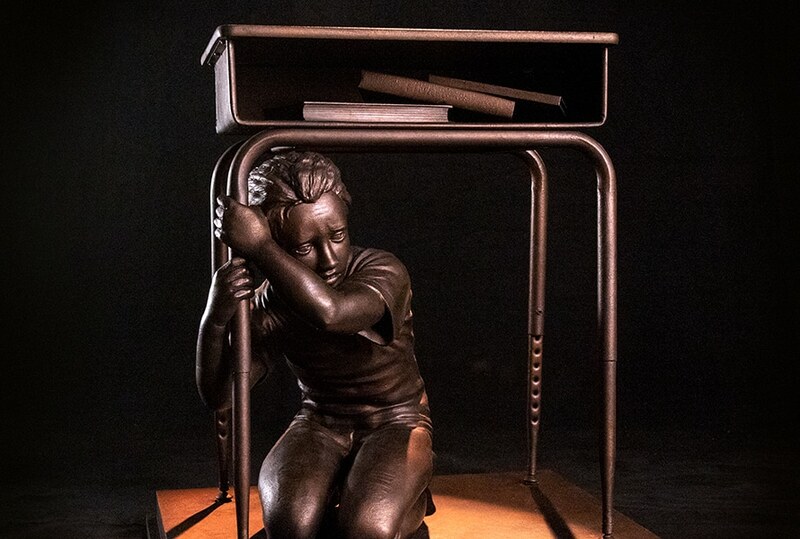 Across the country, a statue of a panic-stricken girl hiding under her school desk has been startling viewers with its visceral portrayal of the impact of gun violence. And its creators hope the work will also lead to a change in the political landscape this November. As a response to school shootings in recent years, lockdown drills have become a routine part of emergency preparedness at many schools. The mental image of children taking shelter under desks or hiding in closets has become symbolic with the epidemic of school shootings. Inspired by the “courage and passion” of student activists in the wake of the Marjory Stoneman Douglas High School shooting, associate creative director/copywriter Dan Crumrine, senior art director Sean Leonard and motion graphics director Caleb Sawyer teamed up with Change The Ref and the Giffords organization for a campaign centered around a startling 3-D printed sculpture of a girl hiding under her desk during a school lockdown. "It forces parents to really pay attention and take notice that this is what their kids are going through." The “Last Lockdown” statue, along with five campaign videos, was used by student activists at 10 voter registration rallies at strategic locations around the country on Sept. 15. “We wanted something that really confronted people with the reality that children are facing, that really confronted adults,” Crumrine explained. 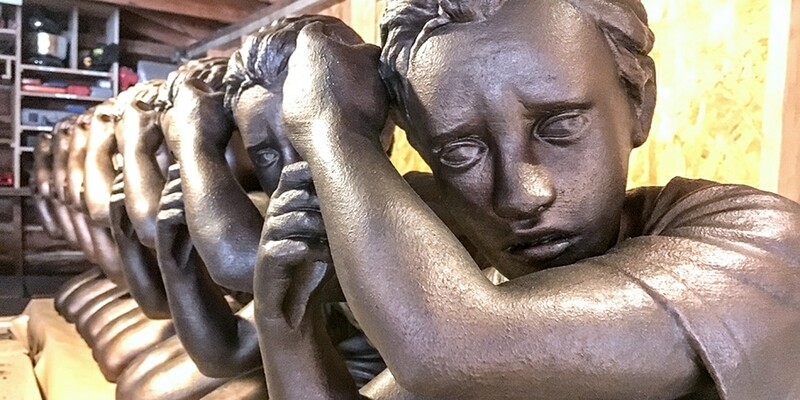 The sculpture conveys an intentional ambiguity as to whether the subject is reacting to a drill or an actual school shooting. In most cases of lockdown alerts, children do not know if the situation is a practice or whether a real threat is on school grounds. “We called it ‘The Last Lockdown’ because that’s what we were hoping for. We’re hoping that this will not be a normal thing,” he added. "It's a reality for students to go through the lockdowns. The parents kind of know what's going on, but you really can't understand the experience until you've actually had it." Last year, she said her high school had two lockdowns. The “Last Lockdown” statue “brings anyone closer to the experience,” she said. After brainstorming ideas, the creative team arrived at the concept for “The Last Lockdown” and reached out to Change The Ref, an organization founded by Manuel and Patricia Oliver, parents of Marjory Stoneman Douglas shooting victim Joaquin Oliver, as well as the Giffords organization, which provided funding for the endeavor. Sawyer led the design of the statue, in collaboration with Crumrine, Leonard and Manuel Oliver. The team went through a couple of iterations of the design before settling on the final startling image. 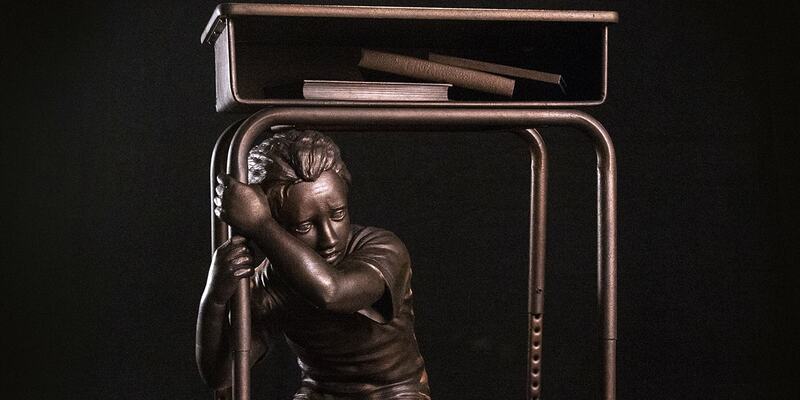 The statue of the panic-stricken girl is 3-D printed, while the desk is an actual student desk with real textbooks on top, finished with a bronze paint. 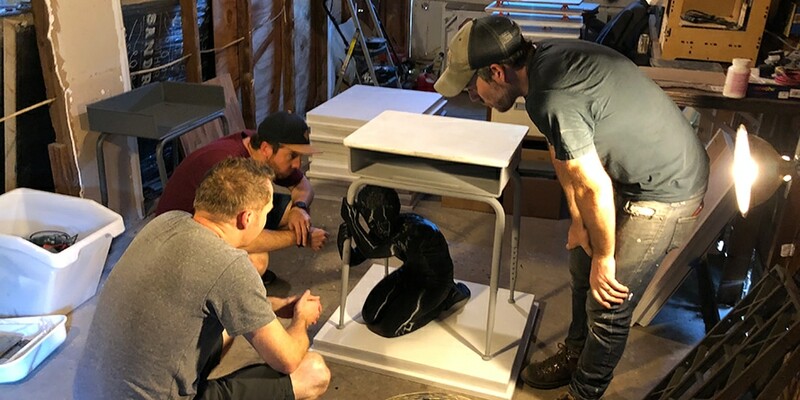 The team behind the campaign worked with production company Paul Bernhard Exhibits and Adam Fontenault, who painted the desk and assembled the finished product. The process began with Sawyer drafting a series of 3-D sketches with a digital sculpting program. Oliver helped take the statue to its final form with feedback about details such as her facial expression, pose and clothing, which Sawyer implemented in the final version, including “playing up the expression on her face to bring a little more panic or terror,” he explained. 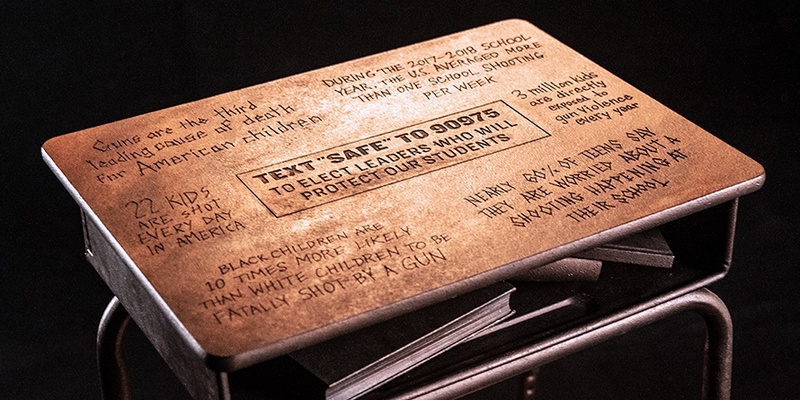 On top of the desk there’s also a series of statistics on the pervasiveness of gun violence against children, along with a call to action. Viewers who text the number will be receive a reply that finds out if they’re registered to vote and directs them either to a voter registration page or a landing page highlighting key midterm elections where voters will have a chance to make an impact on gun control issues. "If someone is backed by the gun lobby, they don't have the best interests of children and students in mind. The goal is to get people to vote those representatives out." The campaign launched Sept. 15 in 10 cities—Irvine, California; Spokane, Washington; Philadelphia, Pennsylvania; Houston, Texas; Denver, Colorado; Saint Paul, Minnesota; Milwaukee, Wisconsin; Sarasota and Parkland, Florida; and Las Vegas, Nevada—which were selected in partnership with Giffords based on their strategic importance to the gun reform movement and the possibility to vote out politicians opposed to gun reform. A series of five short films accompanied the unveiling of the statues, for which the creatives worked with a group of producers, directors and editors who contributed their work pro-bono. The statues were sent to the locations along with instructions for activists to use them as a “springboard” for their own voices, Leonard explained. “The most powerful voices in this are their voices … and we know that. We wanted to create something that would enable them to make their voices heard even louder,” Crumrine added. 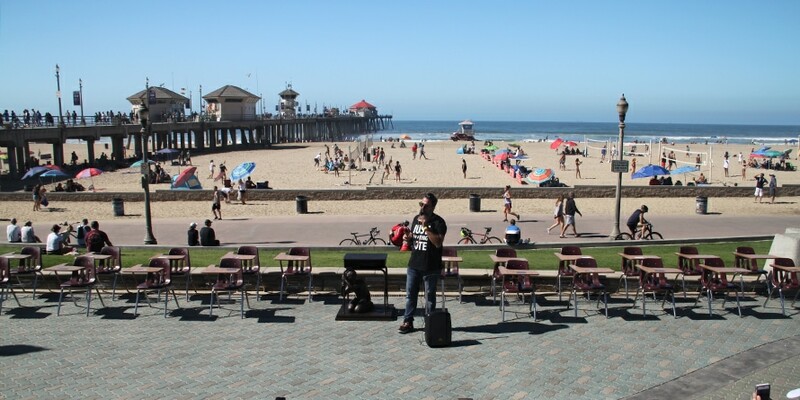 “That’s the real burden that gun violence is having … on our younger generations,” Wagoner said, adding that the image was made “all the more impactful” by its seemingly out-of-place setting outside of Rep. Dana Rohrabacher’s office in scenic Huntington Beach. In Sarasota, Florida, Landry says the statue made a big difference at their event in the strongly conservative area, where David Shapiro is running to unseat U.S. Rep. Vern Buchanan, provoking a powerful emotional response while disarming the dissenting voices typically vocal at such events. “I think you can’t protest in the face of a child who’s hiding under her desk,” she said. Going forward, the statues will appear at events around the country to highlight the issue in different areas, with Chicago and San Diego slated for upcoming events. “The goal for this is to be as visible as possible leading up to the election so that people can see the impact that this is having on children,” Crumrine explained.